Maximuscle's Ache Free ™ is an exclusive combination of Glucosamine HCL, Chondroitin Sulphate, N-acetyl-L-cysteine and Curcumin in mega amounts. Glucosamine occurs naturally in the joints and muscle, where it plays a role in the mobility and the smooth working of connective tissues. Chondroitin is found naturally in the joints where it helps attract fluid into the cartilage. If you are involved in regular intense training, then Ache Free could be an ideal training aid for healthy joint mobilisation. For maintenance, take 3-4 capsules daily split throughout the day. 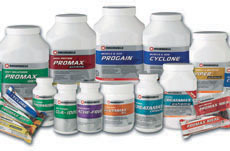 For intense training or faster results take 2 capsules up to 4 times daily. 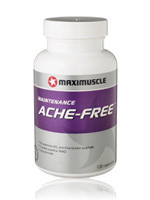 Please Note: Ache Free is not a pain reliever.